A neurofibroma is a benign nerve sheath tumor usually involved with the peripheral nervous system. Neurofibromas are commonly associated with neurofibromatosis type 1, including being an inclusion criteria, but are not always associated with the disease. Neurofibromas are uncommon in the foot and ankle and account for less than 10% of all soft tissue tumors of the foot and ankle. (1) Peripheral nerve tumors are most common in the face, neck, and flexor surfaces. Neurofibromas are characterized by a combination of cells of the nerve sheath including: Schwann cells, peri-neurial cells, and fibroblasts. (2) We report a rare case of a neurofibroma present in the anterior leg arising secondary to a traumatic event. Neurofibromas are among the most common and debilitating complications of neurofibromatosis type 1 (NF1). They account for substantial morbidity, including disfigurement, functional impairment, and may even be life threatening. Plexiform neurofibromas are also subject to transformation into malignant peripheral nerve sheath tumor. The current mainstay of treatment of plexiform neurofibromas, and of malignant peripheral nerve sheath tumors is surgical resection . Neurofibromas arise from a combination of neural cells including Schwann cells, peri-neurial cells, and fibroblasts. Neurofibromas often present painless but can cause debilitating pain and motor sensory dysfunction. Neurofibromatosis I, also known as “von Recklinghausen disease,” is an autosomal dominant condition which is clinically characterized in part by pigmented skin lesions known as café-au-lait spots, benign cutaneous and subcutaneous tumors known as neurofibromas, distinctive bone lesions, and focal malformations of the iris. It is the most common single gene disorder in humans and results from the defective protein neurofibromin, which is thought to act as a tumor suppressor . Neurofibromas are most commonly associated with NF1. A 38 year-old female presented with extreme pain over her anterior leg secondary to a traumatic event. She stated she had a motor vehicle accident five years ago in which her anterior leg was thrown against the front dash and resulted in a twisting motion, as she was turned backwards in the seat after the crash. She was then seen by an outside physician for this pain. The physician surgically removed the nerve in this area and buried the ends in the muscle belly. This gave her relief for approximately four to six months. The pain then resumed in the same area as a burning, aching type pain. She then saw a different physician who started her on phenol injections in the affected area. She relates these injections helped for six months and then stopped relieving any pain. She states she is now noticing skin color changes over the area of these injections. 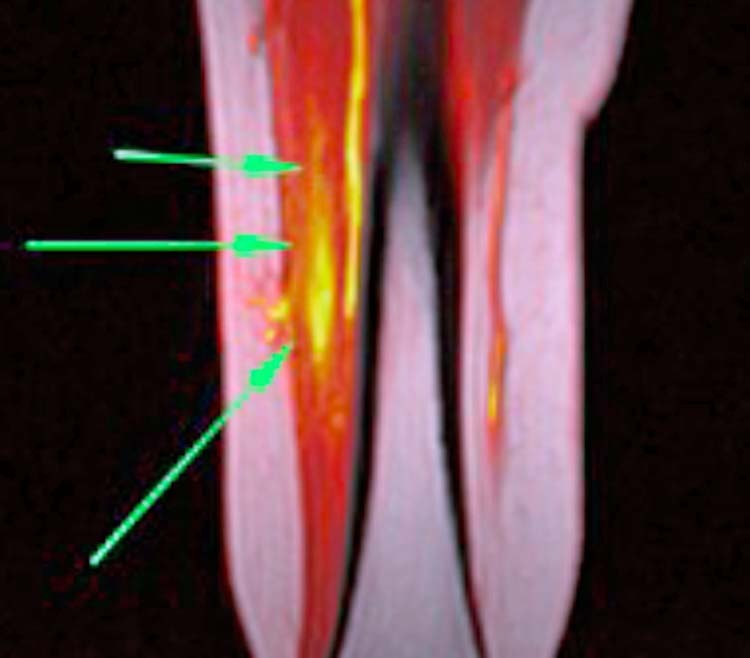 She presented with loss of sensation over the anterior area extending distal to digits two through four. On physical exam she had extreme pain on palpation over the previous incision site. The skin integrity at this site notes discoloration and dystrophic. 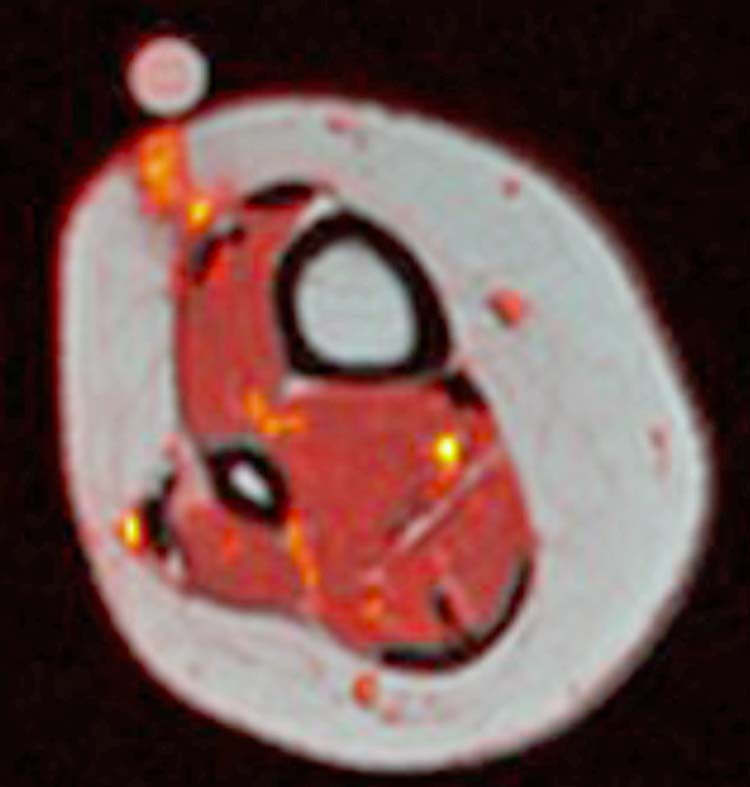 A soft tissue mass was noted in this area of the anterior leg. Muscle strength and vascular status were intact. Magnetic resonance imaging demonstrated a linear nodular intermediate signal in T1and hyperintense on T2. The nodule showed hypointense to fat on T2 fast spin-echo measuring 6 mm. Linear signal alteration extends to the deep fascia and shows a subtle nodular region in the subcutaneous region. (Figs. 1A and 1B) The osseous structures were unremarkable and there were no signs of malignancy noted. Electromyography results demonstrated an abnormal finding in an accessory peroneal nerve branch directly in the area of discomfort. Surgical excision was performed on the mass of the anterior leg. There were large areas of thick scar tissue experienced in dissection through the previous incision. The mass had a noted small nerve branch running superior and medial to it. A 0.6 x 0.6 x 0.5 mass was dissected from the nerve branch and removed. The small nerve branch was then dissected 3 cm proximal where an incision was made in the anterior muscle belly. The nerve was placed through this incision a full centimeter and sewn into place in the muscle belly. Pathologic evaluation showed a fibroma with nerve tissue involvement. An S-100 stain was then performed on the tissue revealing the nodule to be composed of bundles of cells with spindled nuclei. (Fig. 2) The nuclei are bland and there are mitoses present. The overall cellularity of the lesion was low with dense collagen bundles noted. S-100 stain illustrates that some but not all of the cells in the lesion expressed the antigen. Often only a subset of cells stains with the antigen, in keeping with the observation that neurofibromas contain a mixed population of cells. Due to neuron involvement the pathologist gave the diagnosis of neurofibroma. 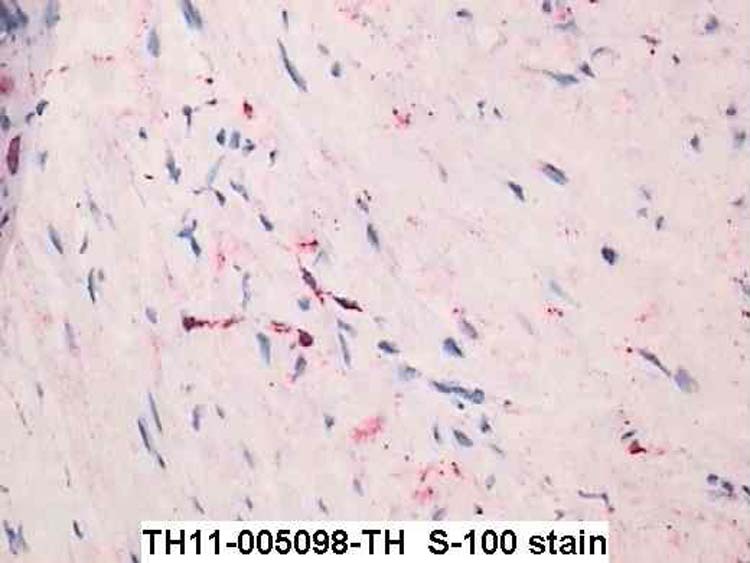 Figure 2 T-100 which stains neurons among other things, shows patchy positive staining within the mass. The positive staining is seen in small nerve fibers embedded in the lesion. At 5 month follow up there is no pain on palpation to the anterior leg. She has had no reoccurrence of the symptoms. She has gone back to work as a flight attendant completely pain free. The incision site healed with no complications. Neurofibromas are tumors involving the fascicles of elongated neuron cells. Although rare in the foot and ankle they can be present especially in the flexor surfaces. Usually associated with neurofibromatosis these tumors can present in patients without the disease. Neurofibromatosis is a genetic disorder of chromosomal mutation in neural crest cells. Neurofibromas may be benign cutaneous nodules and painless but can also cause serious problems compressing nerves and other tissues. A history of trauma can incite a previously painless neurofibroma. Neurofibromas can undergo malignant transformation into a malignant peripheral nerve sheath tumor. In some reports the incident rate has been up to 2-5% . Only two forms of neurofibroma, plexiform and localized intraneural neurofibroma, are significant precursors of malignant peripheral nerve sheath tumors . A series by Donner performed a study of 263 patients who underwent removal of neural sheath tumors. Of these patients, 85% had partial or complete resolution of pain and 87% had improved or no changes in motor sensory function . Nagel reported a case of an athletic long distance runner who developed peroneal neuropathy which did not improve with rest. After further workup he found a mass in the common peroneal nerve causing this foot drop. Upon removal the mass was confirmed to be a neurofibroma. The patient’s symptoms improved once the mass was removed . Certainly neurofibromas can be a harmful soft tissue mass in the body. Although neurofibromas are benign they do have a small incidence to transform into malignancy in the body. Neurofibromas can also cause crippling pain and affect the body’s function. Early diagnosis can help prevent nerve damage or deformity. 1Brian Carpenter, DPM, Associate Professor University of North Texas Health Science Center, Department of Orthopaedics. Director of Podiatric Medical Education John Peter Smith Hospital, Ft Worth, TX. 2Nathan Stickney, DPM PCY-2 John Peter Smith Hospital Podiatric Residency Program, Ft Worth, TX.